The Kim I am referring to in the title of this article is a person featured in those confusing “I’m an energy voter” commercials you frequently see on T.V. in recent years. I used the word confusing because you aren’t really sure what they are are advocating. Guess what, they’re not even meant for you but instead are only meant as a warning to politicians not to cross them. Here is an example of one of those ads. I became a bit curious so I paused it towards the end and noticed it was paid for by the American Petroleum Institute. After a little research I discovered this is a lobbying group that represents around 400 corporations that are involved in production, refinement, distribution, and everything else involved in the petroleum industry. According to Wikipedia In addition to training industry workers and conducting seminars, workshops, and conferences on public policy, API develops and distributes materials and curricula for schoolchildren and educators. The association also maintains a website, Classroom Energy. In January 2012, the American Petroleum Institute launched the voter education campaign – Vote 4 Energy. The campaign says that increased domestic energy production can create jobs, increase government revenue, and provide U.S. energy security. The Vote 4 Energy campaign does not promote any specific candidate or party, but rather provides voters with energy information to equip them to evaluate candidates on the federal and local levels and make decisions in favor of domestic energy on Election Day. The main components of the Vote 4 Energy campaign include the website – Vote4Energy.org – and social media communities, along with a series of advertisements and events around the country. The vote 4 energy campaign was criticized for presenting misleading arguments about the relationship between oil production and jobs whilst ignoring the potentially catastrophic consequences of increased fossil fuel consumption on the Earth’s climate. The API campaign is nothing more than a fresh skin on a very old and stale argument – that President ______ (insert current name) needs to continue opening up more of the nation’s lands, particularly public lands, for oil and gas drilling, OR ELSE______(insert latest political talking point), in this case “jobs jobs jobs” will be lost (a bogus argument). CNN notes the close correlation between API’s target states and some of the hottest states in the 2012 U.S. elections – hint: they’re the same. While the campaign will run nationwide, it will focus heavily on states where Gerard said energy is an important issue – including Ohio, Pennsylvania and Virginia. Those states also happen to be important battle ground states in the upcoming election. It is no secret that the Republicans love the oil industry and have been pushing for the Keystone pipeline in addition to their “Drill Baby Drill” campaign pushed by paid shills like Sarah Palin and others. The reason is pretty straightforward since they receive a boatload of donations from them. Take a look at the exact amounts here from Open Secrets for the 2014 election cycle. 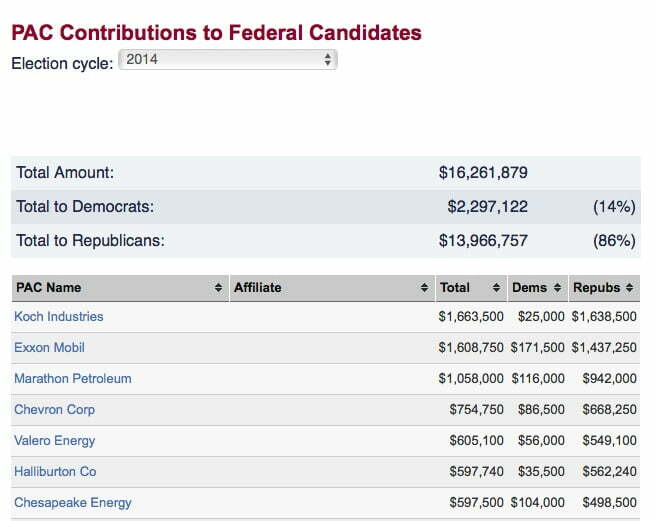 Even though we are barely into 2016 already they have donated close to $7 million to the GOP war chest. These “I’m an energy voter” ads are in essence a not so thinly veiled threat to any politician who would dare oppose their policies. It is not meant to be understood by your typical T.V. viewer and instead is aimed squarely at politicians as a warning not to cross them or their billions in PAC money can very easily be spent against them the next time they are up for re-election. They spent a huge amount pushing for Keystone and did a good job of convincing gullible Republicans that this was good for the economy and would produce a lot of jobs which was a complete lie. It might have produced at most around 2,000 very short-term jobs but at an enormous cost. If Big Oil is sincerely interested in domestic energy security and low-cost gasoline for Americans, why would your industry be clamoring feverishly to maximize U.S. oil and gas export infrastructure that would send our ‘homegrown’ oil and gas overseas to Asian and European markets – raising American gas prices yet higher? While API says its new ads are designed to feature only “ordinary Americans” expressing their thoughts on energy, in reality the industry’s ad agency carefully handpicks people to read from a script. In other words, it is pure astroturfing. API won’t reveal how much money it is spending on the astroturf ad campaigns that will continue throughout this election year. But it will likely rival or surpass what API spent on its 2010 election year ads – roughly $40 million. That’s a lot of job-creating money! Too bad it’s going into bullying ads instead of supporting “ordinary Americans” who need work. What this group really wants is that XL Pipeline to be approved. They claim it will create thousands of jobs and boost the economy, and it will. What they do not tell you is that the jobs it will create are only for the duration to construct the pipeline for most workers, a handful will have a permanent job. They also fail to tell you that it could potentially cause our water and food source to be contaminated if the pipeline ever broke, I say this because they want to run it through America’s heartland. This crude is also high in lead content which would be irreversible environmental damage to wildlife and our forests, streams, rivers and farmland. If you are an energy voter what you really are is a sell out to your country and to the people who live in it. The risk of this pipeline far outweighs any financial benefit it may produce in job creation and to the country. We have already said no to this pipeline through online petitions, the republicans keep pushing for it and Trump has said he would ask them to resubmit the proposal if he were elected. We cannot put our children or their children at risk because of greedy corporations. Say “No” to being an energy voter and save our planet, save our Nation. If republicans want it then they can have it ran through their own backyards, see if they want it then!?! The Greenpeace spook was good. May Macon decision makers would gladly join this group if they though if would help them financially. Growth of any kind is not the answer to making Macon the kind of town people want to live in. Sprawl is already bad, and crime would only get worse. We need a kinder town. What we have now is the have’s and have not’s. And the have’s in business here in Macon have one goal. Part you from your money and in some cases, whatever else they can get from your home. If you have any kind of service call, keep a keen eye on the workers. That also includes realty agents, plumbers, electricians, etc., etc,. These days it is not the business who has to keep an eye on his equipment, it is the home owner.